SCP-805 as observed in ██████ countryside, ██/██/██. Special Containment Procedures: SCP-805 is to be kept in a stable in Sector ██. This is to be locked shut at night with at least one guard of Level 2 clearance or above stationed at the main door at all times. During daylight, personnel of Level 3 clearance or above with adequate equine handling skills are allowed and encouraged to interact with SCP-805, provided they are wearing full body coverings or hazmat suits. SCP-805 is to be treated like a normal young horse and is allowed into the adjoining courtyard for exercise during the day. At this time, samples may be taken from SCP-805 for testing. Staff are reminded that SCP-805 will react to inappropriate treatment like a normal horse, which resulted in Incident [DATA EXPUNGED]. Any personnel found to be mistreating SCP-805 will be immediately removed from the area and clearance to SCP-805 revoked. 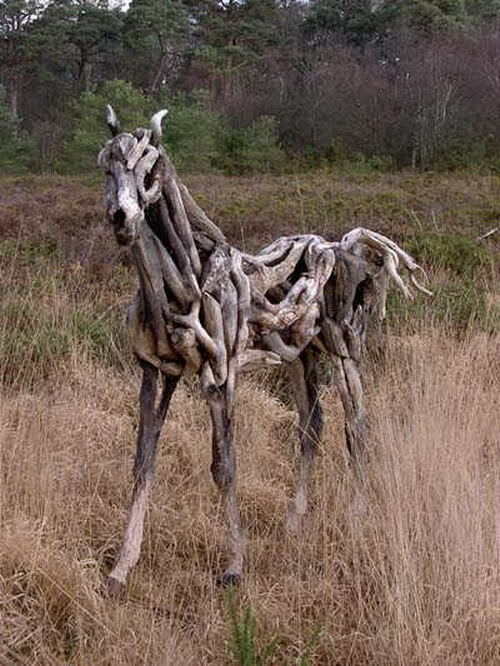 Description: SCP-805 is an assortment of branches and roots twisted into the shape of a young horse, 101.6 cm high. Its interior is completely hollow of any organs; however, the object is mobile, mimicking the movements and instincts of a typical young foal. It is drawn toward human presences, actively seeking contact with skin, and has been reported as being 'very friendly' when approached. It does not require food or water and there has been no growth recorded since containment in 20██. Scrapings of wood from its frame have revealed it to be of an unknown species related to the 'poison-oak' plant, Toxicodendron diversilobum. Upon contact with SCP-805, human skin shows signs of irritation not unlike that caused by poison-oak. The skin turns red and begins to itch as small red bumps erupt from the flesh. No remedy prescribed for poison-oak will ease the itching or rash. Two to three days after the rash has appeared, the irritation will flare and spread rapidly until the entire surface of the skin is covered. Subjects have reported excruciating pain both internal and external, with skin beginning to change colour between pale brown or green. Movement in the joints becomes stiff and increasingly more difficult. As the internal body pressure rises, blood will be forced out various orifices of the subject, including their eyes and fingernails. Bone width increases, and muscle is absorbed into the widening bones which thicken rapidly, causing [DATA EXPUNGED] to the subject's body like that of SCP-805 itself. The transformation has been observed to take 3 to 8 hours, depending on how much bare skin was infected by SCP-805, each result ending with the subject [DATA EXPUNGED]. X-rays have shown them to be completely hollow inside. However, it is theorized that the subject may be still aware and conscious as, despite no mobility, pulse or breathing found post-transformation, the remains have been observed creaking and groaning as if attempting to move. They do not respond to tests with normal stimuli and most noises appear to occur when in the vicinity of SCP-805. These corpses do not carry the infection of SCP-805 to other humans but it is still recommended that they are handled with thick gloves to prevent splinters. Remains are to be observed for a time after transformation before being incinerated. Addendum 865-01 SCP-805 was discovered in the ██████ countryside, with authorities alerting the Foundation after a series of [DATA EXPUNGED]. SCP-805 did not resist capture and containment, but resulted in the deaths of █ staff during this time. Its origin and age are unknown.